Get your bathing suites, sunblock, and sunglasses ready and hit up one or two of these amazing water parks! Summer is the time to get out there and experience all types of adventures, so why not get to know some sea creatures or plummet down a thrilling water slide? All the parks on this list also have relaxing areas for mom and dad and attractions for the smaller kids who aren't old enough to go on adrenaline-inducing rides. No matter what fun in the sun you're looking for, these are the top 10 water parks you must visit this summer with your family! Ever wanted to swim with dolphins or sharks? Snorkel with fish and rays? Hand-feed tropical birds? Or experience a face-to-face encounter with playful otters and curious marmosets? Dolphin lagoon, wind-away river, and explorer’s aviary are just some of the adventures you can take on in Orlando’s Discovery Cove, the action-packed aquatic park. During your visit, you can interact with sea creatures like sharks, rays, otters, birds, fish, and dolphins. You can also enjoy unlimited access to a varied selection of food and drinks all day long. For those looking for some extra fun, there's an upgraded drinks package. From the little ones to the big ones, there's fun for everyone at this water park! 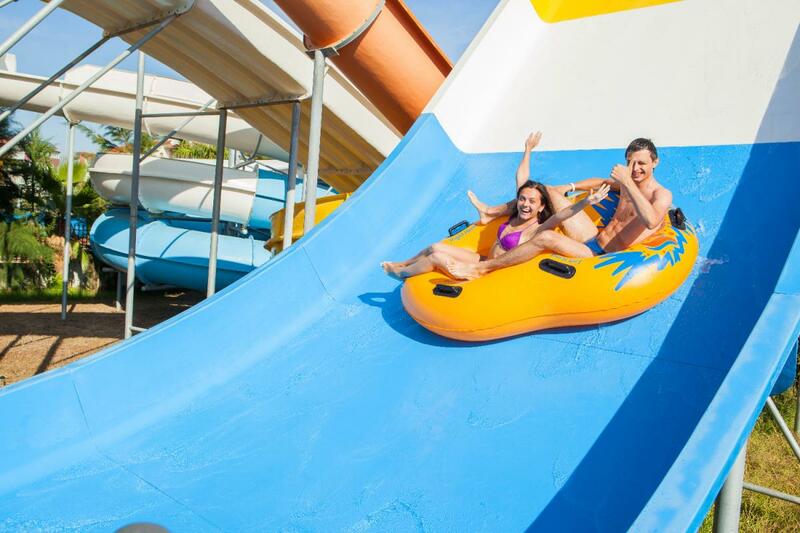 Waterworld is United States’ biggest water park with about 40 water attractions, so there's more than enough fun to choose from for the whole family. There are attractions for the little guys like The Storm, where they can plunge in the dark, perilous depths of the monster Storm. But don’t worry, it's kid-friendly! If you are a thrill seeker, then the Skyline Speed Slides are the attraction for you. Are you brave enough to plunge six stories down Red Line, Pipe Line, and Flat Line? After this thrilling experience, maybe a float along one of their many rivers is the move, like their fun Thunder River. Pharaoh’s Feast is open June 8through August 11offering BBQ chicken, hamburgers, hot dogs, and more. Guests can enter as many times as they like with the purchase of the All-You-Care-to Eat Dining online or by visiting any park Guest Service location. What's so special about Schlitterbahn Water Park in Kansas City, you may ask? For one thing, it has the tallest water slide in the world! It plunges riders down on a raft from 15 stories, reaching speeds up to 70 miles per hour. This water park also has the world’s biggest tidal wave river, a relaxing adventure for the whole family to enjoy. Other things you're able to enjoy here are tubing rivers, uphill water coasters, Boogie Bahn surfing rides, and picnic areas with shade where you can enjoy your own food you bring in to the park if you wish. If some grub in the park is preferred by your crew, Gator Grill Pizza, ICEE Mix-it-Up, and Schatze’s Sweet Shop along with several other locations are there to offer you delicious snacks to sustain those bodies after so much thrill. If you're an adrenaline junkie, then you must visit the Dive Bomber, the tallest water slide at Six Flags White Water. It debuted in 2015 and, shortly after, was named the Best New Water Ride in 2015 by Amusement Today. This thrilling ride is a revolutionary concept: you stand inside a capsule and wait until the very trap door underneath you opens all of the sudden, sending you down the slide nearly 90 degrees and splashing into the water at the end. This water park has many more attractions for the whole family like the Bahama Bob Slide, where your entire family can work together to travel across 600 feet of adventurous rapids. This fun adventure-packed water park has season passes as well as membership opportunities, but keep in mind they're currently closed and will reopen in May 2019. Ice cream, funnel cakes, corn dogs, salads, burgers, and even veggie burgers are just some of the snacks you'll be able to munch on for some fuel so you can put your body through all the action this water park has to offer! If you want to experience Virginia’s first-ever water coaster, then you need to head to Water Country USA. The Rocketblast water coaster, making its debut in 2019, is Virginia’s first hybrid water coaster. This new attraction will feature some cool, new technology: a water jet propulsion system and saucer feature. There’s a four-person raft that travels up and down some steep hills and takes you on a thrill of a lifetime. In this water park, there’s a balance between thrill and relaxation as you can reserve your spot in one of their three spa-like locations: Hubba Hubba Highway, H2Oasis, or Surfer’s Bay, or just hang out in either one of their loungers or cabanas. This water park truly has it all, including a Cashless Wristband program allowing you to pay whatever you wish without having to reach for your wallet. Noah’s Ark in Dells, the waterpark capital world, is the nation’s largest water park. Located on 70 acres of land, it has over 51 slides, a Safari Mini Golf, rivers, raft rides, monkey rapids, and many more attractions the whole family can have fun in. Raja, one of their most thrilling and popular waterslides, is a side-by-side tube race that plunges riders from six stories into 32 mph of twists and turns. Noah’s Ark is also a great place to celebrate your birthday with their Birthday Party Deal including all-day admission to the park, reserved seating at Trader Jack's, choice of party time, a free water toy for all guests, and pizza lunch with fountain soda. Not bad for only $33.99! Johnny Rockets, Pink’s Hot Dogs, and Italian food at Pasta Mia are some of the food choices that are available in this water park as they have options for everybody, including a few bar locations like The Wave, Paradise Lagoon, and Big Kahuna Area. Named as The Smokies' #1 place for summer fun, Dollywood’s Splash Country is a top choice for families looking for some water-themed fun for the summer. This Smoky Mountain retreat has it all: thrilling rides, relaxing lounging areas by the pools, and fun for the little ones as well. The 35-acre water park has nerve-wrecking slides like Fire Tower Falls, the park’s tallest set of twin slides that rise 70 feet into the air and plummet riders into a 140-foot water-filled lane, making for a huge splash when they arrive at the bottom. You might want to try Tennessee’s first-ever and only water coaster, River Rush. This exciting 1,175-foot-long coaster twists and turns through the trees like a normal land coaster would, but with a lot more splash. Little Creek Falls is their activity center for the little guys with fun slides, a children’s pool, and more! Butterfly Wings provide a shade area for mom and dad. If you want to get the most out of your Dollywood Splash Country Experience, look into their TimeSaver H20 Pass, a way for you and your family to get around the park without having to wait around all day in lines. Reserve your spot in any line for many of the water park’s most popular attractions. This might be one of the coolest water parks you’ll ever visit because its 1960’s-themed with surfboards and sandcastles decorate the space, making your visit a truly unique experience. Not only are they hip and innovative with their theme, but they offer some major luxurious experiences like their VIP Cabana experience, including a 10x10 shaded cabana, dining tables for up to 6-8 guests, mini fridge, charging stations, an attentive wait staff, and much more! These have limited availability so be sure to reserve your cabana online or call 24 hours in advance. Cowabunga has many other awesome attractions like their own entire beach! Mad-made obviously, but a fun way to chill with the family nonetheless. The space is 2,500 square feet, allowing guests to spread out and soak up some sun. Along with their luxurious cabanas and relaxing beach, they have one huge water playground where the entire family can have fun in all day. With 300 interactive water toys and eleven water slides including Mondo, their 1,000-feet-long slide that twists and turns through the darkness, it’s hard to find yourself bored in this action-packed water park. Who wouldn’t want to visit sunny Florida on a hot summer day for some fun in a water park called Adventure Island, literally an island full of adventure! Their newest slide is for those thrill-seekers who are looking for that rush. Prepare to vanish as the very floor underneath you literally disappears: Vanish Point is a slide that lets you choose between two skyboxes and plunges you into a 70-foot drop through spiraling tubes until you reach the big splash at the end, becoming your new favorite ride of addictive adrenaline rush. For the kiddos, Paradise Lagoon is their fun escape that is full of slides, waterfalls, and a huge pool to swim in. If the kiddos are looking to catch some waves, Endless Surf is their 17,000 square-foot wave pool that rolls waves every five minutes. Float along the relaxing half-mile tube adventure Rambling Bayou, taking you through a beautiful rain forest. Rome through the waterfalls and catch a break from the thrill with the family. Their awesome All-Day Dining Deal offers guests the opportunity to pay just $34.99 for adults and $19.99 for kids to enjoy all the meals the water park has to offer, like freshly-prepared fajitas from the Duval Street Grill or some loaded French fries from Island Bites. Located right next to Seaworld San Antonio, this water park is packed with fun water attractions that will have you screaming. Their newest attraction, the Taumata Racer, is a must. Six side-by-side lanes drop guests 55 feet in under 10 seconds, creating some fun, friendly competition among friends and family. This high-speed waterslide allows guests to use foam mats that used for bodysurfing. This fun racer slide launches riders through a 180-degree turn and then straightens out and gives riders a thrill as all of that happens under 10 seconds. Look into their Quick Queue program for passes that help you save time, skip the lines, give you unlimited priority entrance at some of the attractions, and one-time priority boarding on Stingray Falls and Ihu’s Breakaway Falls. The water park's signature attraction is definitely a sight to see: Stingray Falls takes guests on rafts of four through an underwater grotto, where you can get up-close-and-personal with stingrays and other tropical fish. This ride is its only kind in the world! Staying in-state this summer? Find fun things to do in Tampa by registering on 813area, your free local guide to the Tampa Bay area.